Bedesoft.org E-LEARNING PLATFORM FOR UGANDA is a new initiative by Sir. MUNYAGWA NICHOLUS KUSIRIKA. the website has a great set of video and audio lessons explaining some key ICT and Computer Studies concepts. 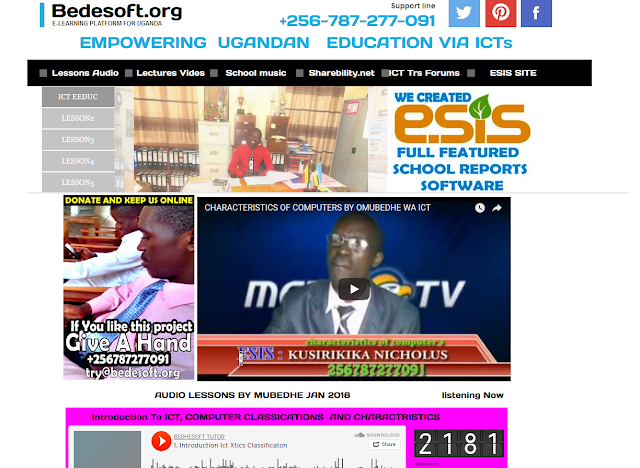 Nicholas is an ICT teacher at Nakamwa SSS, but he is also does school music composition and software development at bedhesoft company, the creator of the popular ELECTRONIC SCHOOLS' INFORMATION SYSTEM esis being used by several Ugandan schools. He earned the "SIR" title from his highness the King of Buganda after composing the "EBINYIGA OBUGANDA " single that portrayed all historical and political challenges of Buganda in only 3 minutes. The videos and school music can all be found on his Bedhesoft Filming channel on Youtube. Research suggests that people learn abstract, new, and novel concepts more easily when they are presented in both verbal and visual form. Other empirical research shows that visual media make concepts more accessible to a person than text media and help with later recall. In Willingham's (2009) research he asks a simple question to make his point, "Why do students remember everything that's on television and forget what we lecture?" 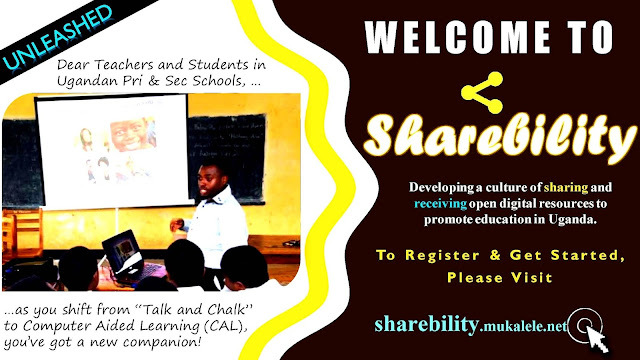 – because visual media helps students retain concepts and ideas. Bransford, Browning, and Cocking (1999, p 194) also note the crucial role that technology plays for creating learning environments that extend the possibilities of one-way communication media, such as movies, documentaries, television shows and music into new areas that require interactive learning like visualizations and student-created content. The more interested and engaged students are, and the more interactive each learning session is, the more students will enjoy, learn from and retain information from the lesson. Video provides a means of interactive instruction and is a very flexible medium. Having the ability to stop, start and rewind is absolutely invaluable. As educators, our aim is to get students energized and engaged in the hands-on learning process, and video is clearly an instructional medium that is compelling and generates a much greater amount of interest and enjoyment than the more traditional printed material. Using sight and sound, video is the perfect medium for students who are auditory or visual learners. With the added use of subtitles each child then has the choice to watch, listen to, or read each presentation. Video stimulates and engages students creating interest and maintaining that interest for longer periods of time, and it provides an innovative and effective means for educators to address and deliver the required curriculum content. Media -- Brings your lessons to life!